Students will be able to find the definition and real-life examples of a wave phenomena to present to the class. Students jigsaw the wave phenomena and create a Frayer model for a wave phenomenon like Doppler effect, light as a wave or particle, and resonance. The goal of this class is to introduce students to the characteristics of sound and light and how they relate to ideas of frequency, amplitude and wavelength. 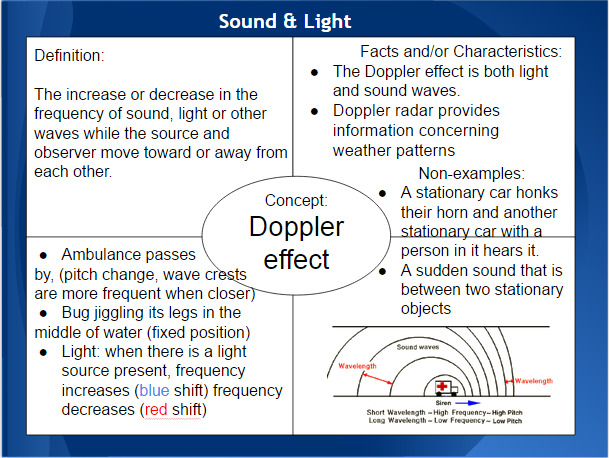 Additionally, in groups students use their reading skills to develop a Frayer model to explore one wave phenomena (such as Doppler effect, the photoelectric effect, and resonance), fulfilling HS-PS4-1 and HS-PS4-3. While exploring, they construct a presentation where they need to explain the different aspects of the wave phenomena to the class (SP6). Students prepare this Frayer model to present and teach to the class in the next lesson (SP8). 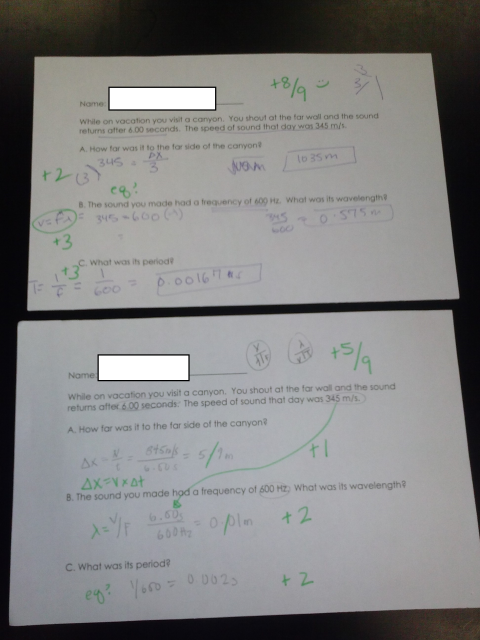 To start class, I pass back the Wave Equation Checkpoint that they completed from the previous class. As I was grading these exit slips, I noticed that the rearranging of equations seemed to be something that was a common error so I wanted to talk about those concepts. Additionally, my students got tripped up on the canyon problem. It takes 6 seconds for it to return to you when you shout in a canyon and forgot that it was an echo; so they needed to divide the time in half to determine the time it took to get to the wall. Otherwise, they were able to identify the quantities and units. To go over the exit slip, I model how I would have gone through the problems. As I go through each part, I ask students if they have any questions about that question before moving on to the next set of problems. For additional practice, I tell students to work on a problem every day or two to keep practicing using the equations and if they need more practice, they can start working on the problems in the Review in their packets. 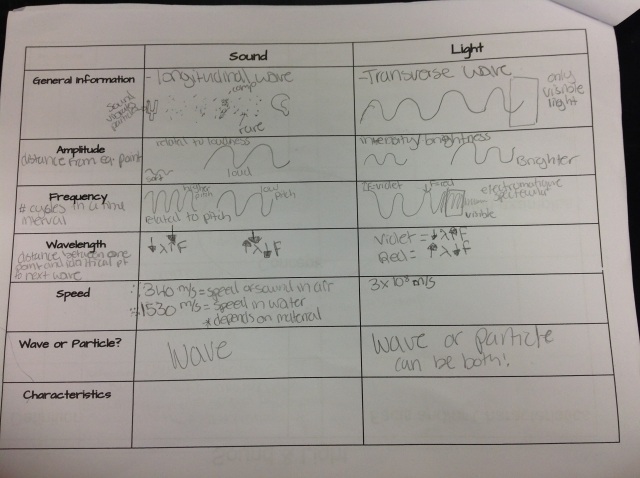 After we have discussed the checkpoint, I ask my students to turn to the Sound and Light Chart in their packets so we can look at two examples of waves that we deal with in real life and how they are related to the different properties that we have discussed in class like amplitude, wavelength, frequency and speed. The video below shows how I go through the notes for students. I start from the basics of sound and light waves and cover the specific properties found in sound and light. Some of these topics are things that students have had some exposure to so I make sure to use student volunteers to help me fill out some of the notes based on what they already know. The image below shows the notes of a student including aspects of both sound and light. After the sound and light notes, I tell students that each group investigates a characteristic or phenomena that is shown by either sound or light and teaching the class about it during the next class period. The phenomena that they investigate include: interference, Doppler effect, resonance, reflection, refraction, diffraction and photoelectric effect. I assign each table a characteristic for their group to complete a Frayer Model about their topic on their Chromebooks. In the Frayer model, they find out the definition, facts or characteristics about their phenomena, examples and non-examples. I use the Frayer model because it gets at all of the important ideas that they need to know about each phenomena. Before they get to work, I show them the Sound and Light Resource Page that has a link to a website that discusses their phenomena as well as pages in their textbook that also discuss the phenomena so they can find their information. I give them about 20 minutes to complete their Frayer model as a group. I suggest to them that they read the resources first and then divide up the work (ex. one work typing up examples, another the definition, etc.). I require each group to include a picture in their Frayer model to show other groups what it looks like in either sound or light. As they are working, I walk around to be available if questions arise. They are becoming experts on their phenomena so I want them to feel confident for when they present this information to the class during the next class period. Below is an example or student work. I have the students learn the material this way because there are many different topics to learn. By becoming an expert on one and then presenting and sharing with the class, students can learn about how each phenomena to sound and light. This activity is also meant to have students investigate what evidence there is for light as a wave or a particle. To end class, I ask students to complete a Post-It Exit Slip by describing how their work time was with group as they worked through the Be the Expert Frayer Model together. I ask them to be specific about the things that did well as a group and things they need to work on. 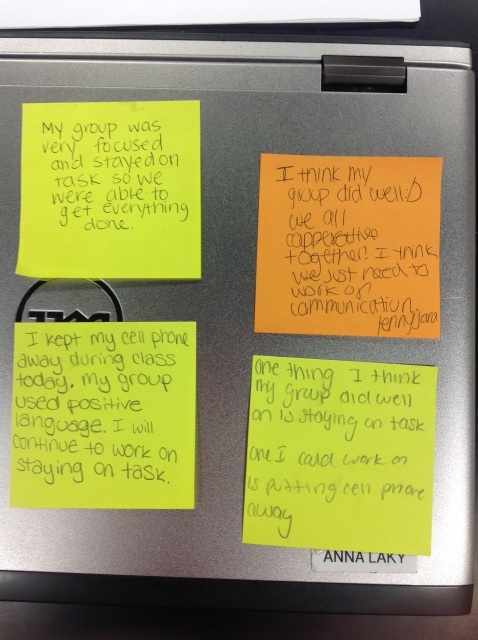 The results are shown below of students' responses to their group work. I do this exit slip to get a sense of how students used their unstructured work time. I find that most groups were able to focus and work together likely due to the presentation they are required to give in the next class. This is a nice way to end the lesson so I know how students worked when putting together their presentation.